JMW: Hello, this is Jean Marie Ward for BuzzyMag.com. With me, today, is the best-selling author of “Vicious ” and the newly completed “Shades of Magic ” trilogy, V.E. Schwab. Welcome, V.
JMW: Thanks for talking to us in the middle of a truly crazy book tour. You were in California yesterday, you’re in Virginia today, Boston tomorrow. How do you cope? V.E. Schwab: By getting very little sleep and a lot of caffeine, a lot of caffeine. JMW: Ah! And you’re working on line edits on top of all that? V.E. Schwab: I am. I have five days to line edit a 350-page manuscript while on tour. JMW: Ouch. Lots of caffeine there. Let’s talk about the new book, “A Conjuring of Light “, and the “Shades of Magic ” trilogy. Did you know where “Conjuring” would end when you sat down to write “A Darker Shade of Magic “, or did you discover the story as you wrote? V.E. Schwab: I actually knew exactly how it was going to end when I sat down to write it. I write my endings first. So I knew the ending of “A Darker Shade of Magic“, and the ending of “A Conjuring of Light” before I ever started writing “A Darker Shade of Magic“. I find that if I know how it ends, then I can figure out how it needs to start, both for plot and for characters. I need to know who my characters are at the end of a series to understand who they need to be at the beginning. JMW: If you’ve got that all plotted out, was there any aspect of the series, whether it be in the story or its characters or the setting, that surprised you? V.E. Schwab: Only one aspect of the entire series surprised me, and it’s a spoiler, so I can’t say which, but it is in “A Conjuring of Light“. One character did not end up where I thought they were going to end up. V.E. Schwab: They took over. They chose another path. JMW: That’s their right as characters. You’re obviously doing something right. In many ways, the “Shades of Magic” trilogy seems like a logical progression from the YA fantasies you wrote as Victoria Schwab. 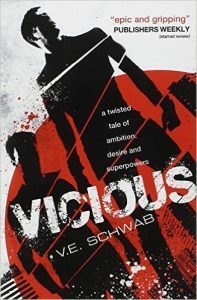 “Vicious“, on the other hand, is a superhero story. What prompted you to strike out in that direction? JMW: Ah. Well, monstrosity and monsters is a big theme in your work. Did that play into the “Vicious” theme? V.E. 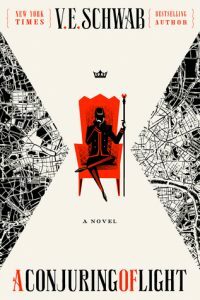 Schwab: I think I’m fascinated by the line between hero and villain, and human and monster, and life and death, and all of those things kind of circle all of my different stories. I, actually, at the time I was writing “This Savage Song “, which is about actual monsters, was getting a degree, a graduate degree in Medieval Art History, studying monsters, at the time, so I studied depictions of monstrosity in art, and depictions of monstrosity are, at their core, a reflection of things that humans fear. And so, that kind of theme permeates a lot of my work, what it means to fear and to be feared. JMW: And was it anything about liking superhero comics when you were little? V.E. Schwab: I mean, I liked super-villains when I was small. I was never in it for the heroes. But, I mean, Magneto was one of my favorite comic book characters of all time. I consistently gravitated towards the antagonist, and the anti-heroes, and the flat-out villains, so it made sense if I was going to write a book with superheroes, quote unquote, that they were all going to be villains. JMW: Oh, how cool. Very cool. These days, you write both as Victoria in the YA arena, and V.E. How hard is it to switch from one mindset to the other? V.E. 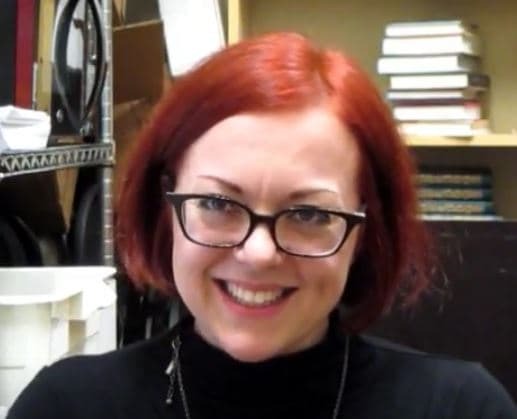 Schwab: Well, I write as Victoria Schwab for children and teens, and then I write as V.E. for adults. I don’t think it’s any harder for me to switch between the two of those as it is for me to switch between any two projects. For me, the transition between any two books is difficult. It’s not like I change my writing style or my voice, or the elevation of it when I’m writing for children or teens. I write the exact same way that I would write to them as I would write to an adult. I don’t believe in writing down to an audience, ever. And so, some of the themes might change, some of the urgency might change, and the action, but in terms of the way that I write, it’s really just about finding my footing with every new book. JMW: And knowing the ending. V.E. Schwab: And knowing the ending. I’ve never written a book I didn’t know the ending to. JMW: Go you! Your next book will be a Victoria novel, as it were, “Dark Duet“, the second novel in the “Monsters of Verity ” duology coming in June, fingers crossed. Can you give our viewers a little teaser about that story? V.E. Schwab: That’s hard. It’s a duology, so it’s a two-part story, and I really see it as eidetic, something in which these two halves make a whole, fold together. And, in that way, the first book in the series, “This Savage Song “, is the origin story for the second book in the series. The second book in the series is Kate and August in their new selves, and they’re the kind of selves that came together because of the actions of the first book. And it’s the second half of their road, and it’s dark and intricate, and it’s been very difficult to write. It’s quite timely, as “Savage Song” was, when I was writing it, a very violent period in our country, and it deals a lot with the notion of refugees, and who’s welcome and who’s not. In the aftermath of “This Savage Song“, half of the city is now, essentially, refugee status. They don’t have governance, they don’t have anyone to protect them, and they seek shelter in South Verity, and a lot of South Verity doesn’t want them there because they weren’t willing to fight for themselves at the time. And so, there’s a lot of, obviously, quarrel between the humans and the monsters, but there’s far more quarrel between humans and humans in the story. JMW: …in real life. Has it been hard to work on it, given the accidental timeliness? V.E. Schwab: …and while I’m traveling to promote. And so, after this book goes to print, I’m going to take a nap. JMW: Okay. So, what are you working on now, which is something we ask every author because all their fans want to know in advance. We know what you’re working on, making line edits. Do you have an ending acting like a beacon, glowing in your mind at the moment, for a new story? V.E. Schwab: I do, I do. I’m currently contracted through 2021, so I have several new stories, but I have one, in particular, I’ve been waiting about six years to write that’s finally coming up, called “The Invisible Life of Addie La Rue“. It’s about a love story between a French girl and the devil over 300 years. JMW: I like it already. You had me at ‘devil’. Okay, we’re coming up on the end. Is there anything you’d like to add? V.E. Schwab: No, I just… Honestly, I’m in the middle of tour right now, and the turnouts have been so incredibly humbling. I’m so grateful to my readers. This is the series, “The Shades of Magic” series, that has been made one reader at a time. It’s an evangelistic series. It’s the kind where someone becomes a fan of it and then forces all of their friends to read it. And it’s just been one of the most humbling experiences of my life. JMW: Great. Well, thank you, Victoria, and thank you for BuzzyMag.com.